Tardis is still lollygagging around down in Florida, which is just as well since (once again) snow showers are forecast for tomorrow. It has been hard getting the shop back in shape and back to work. But one of the distractions was accompanying Molly up to Maine for the Governor’s Travel Conference in Portland, surely one of the coolest cities in the Northeast, if not the world. I took a day to scope out a base camp for next summer’s trip to Maine and I think found a home at the Gamage Yard in South Bristol. It just shouts Maine, lobsters and boats, and has a famous history as the birthplace of scores of wooden boats. Their website takes great pride in noting that they have now installed a by-gum shower for the yachties. 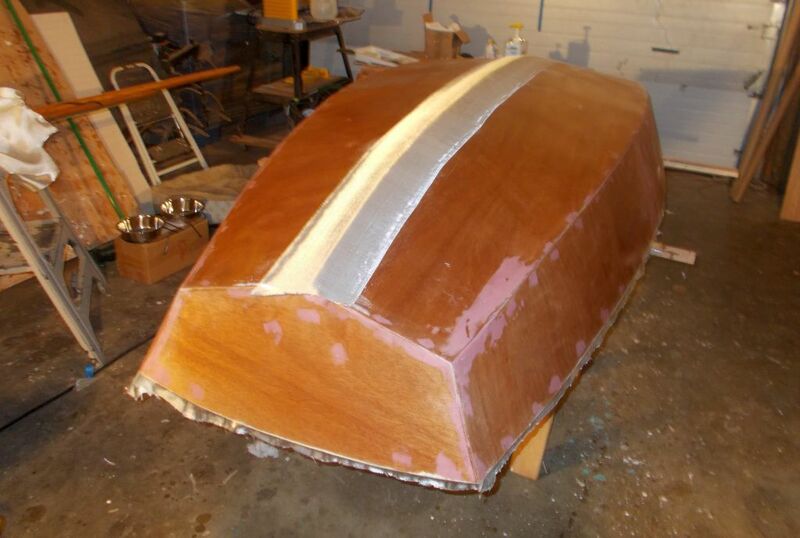 The dinghy is moving along. It was just normal glasswork — fairing imperfections and the chines out with AwlFair, a coat of plain epoxy to assure a good bond for the glass, and covering with 6 oz. cloth. Offcut is narrow enough that I could use 38-inch cloth down each side with a seam in the middle. 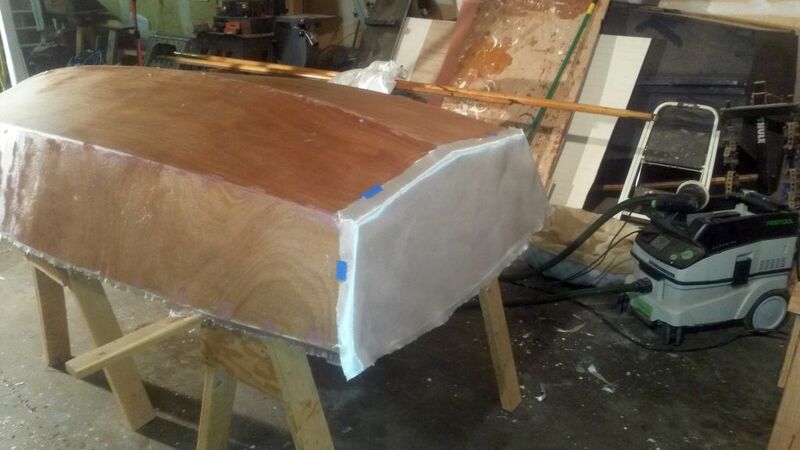 I wrapped the sides over the transoms, then the transoms over the sides for a double layer on all the wear areas. Then I put a layer of 12-oz tape that I had leftover from something or other clear down the middle. No pictures of the actual glasswork — you just can’t handle a camera in epoxy-drenched latex gloves. 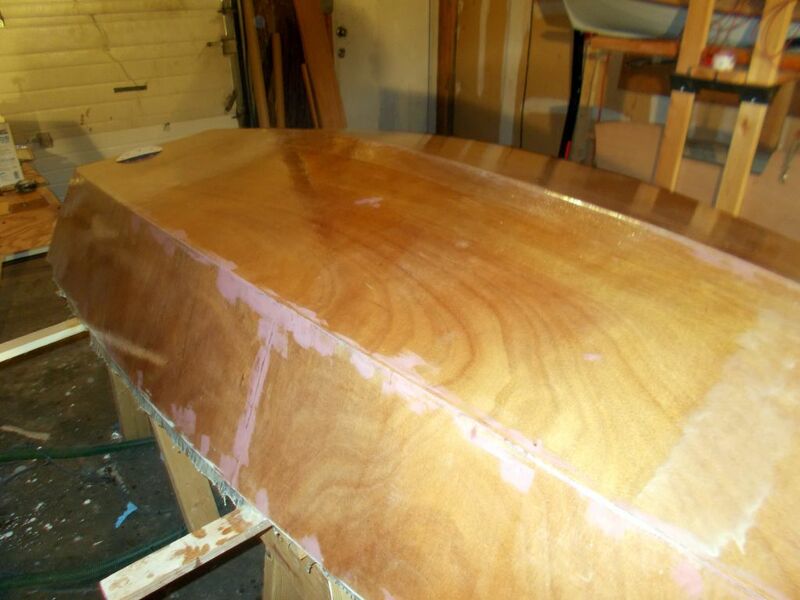 Glasswork is messy, but not that hard — dump epoxy on the horizontal surfaces and spread into the cloth with a wide putty knife until it’s transparent, then scrape the excess off into a “grudge cup” until you hear a sound like corduroy pants rubbing together when you are moving fast. (If you have never worn corduroy pants you obviously can’t do glasswork. I don’t know why I have never seen an instruction manual that says, “First, buy a pair of corduroy pants (color optional”). 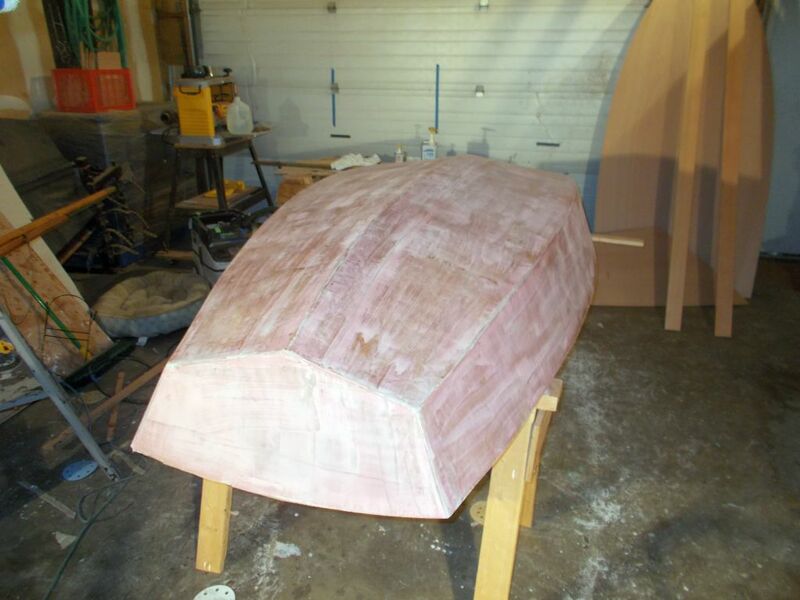 The sides have to be filled by brush, but on such a small boat, not too difficult. I ran into trouble during the fill stages. You have to fill the weave of the glass with epoxy by rolling on several coats. But I thought I could speed the process by brushing a thick layer brought to syrupy thickness with micro balloons. It looked fine going on, but when I came back the next day, it had sagged and dripped all over the place, since it was just too heavy to stick to the glass. An area that I had just brushed on lightly to see what would happen looked fine. 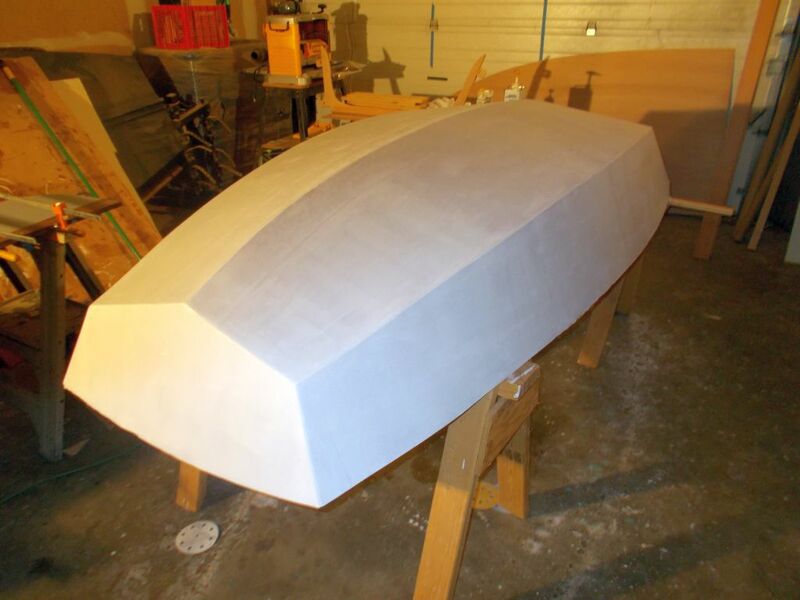 This cost me three hours of sanding trying to smooth the surface, and in the end I troweled on a full coat of AwlFair, just to be sure that all the rough areas were covered over (another three hours). My mistake was thinking that I was still working with the polyester fabric (Xynole) that covers Tardis, when I was working with plain glass. Glass fills much easier, and I should have just rolled on three or four coats of epoxy and been done with it. 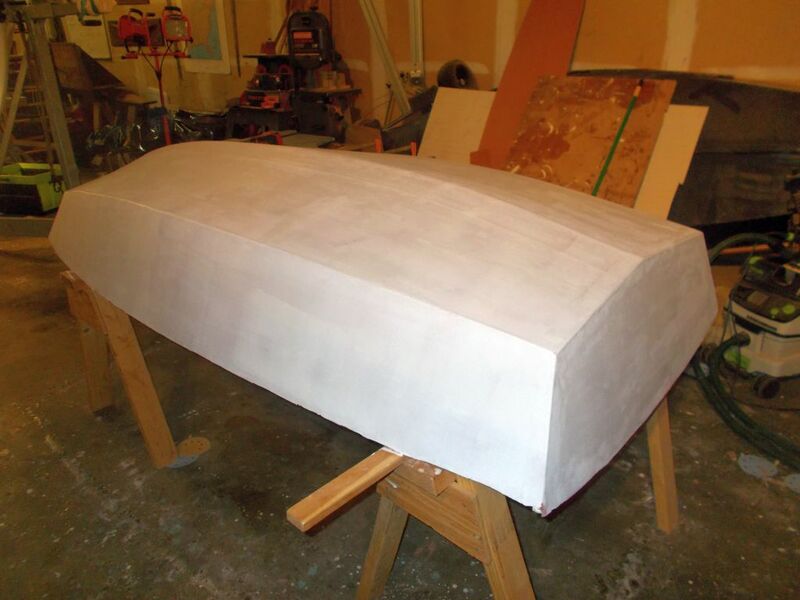 The only consolation is that with all this coating, the primer looks really smooth going on, and should provide a great finish for paint. 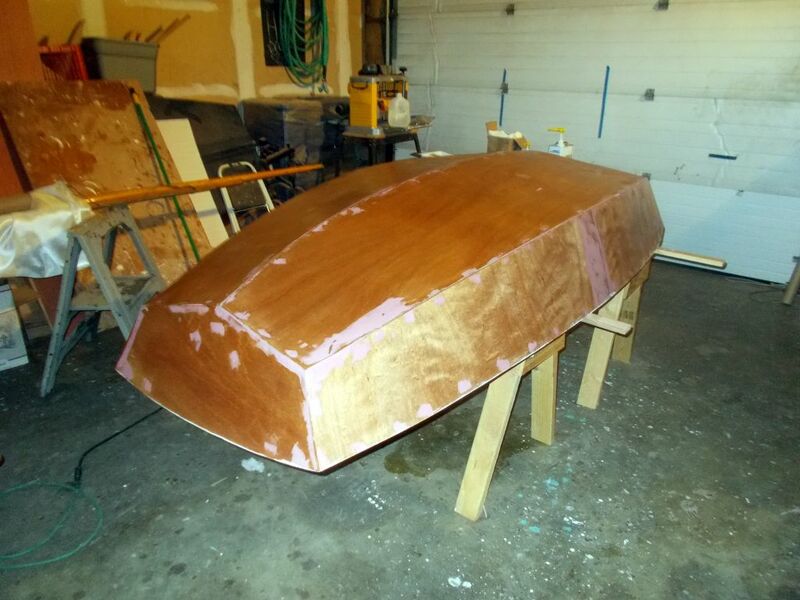 First coat of epoxy – the “cheater coat” – which I guess professionals don’t use since it soaks up a lot of epoxy. But I always use one to guarantee a good bond. Transom glass in place. 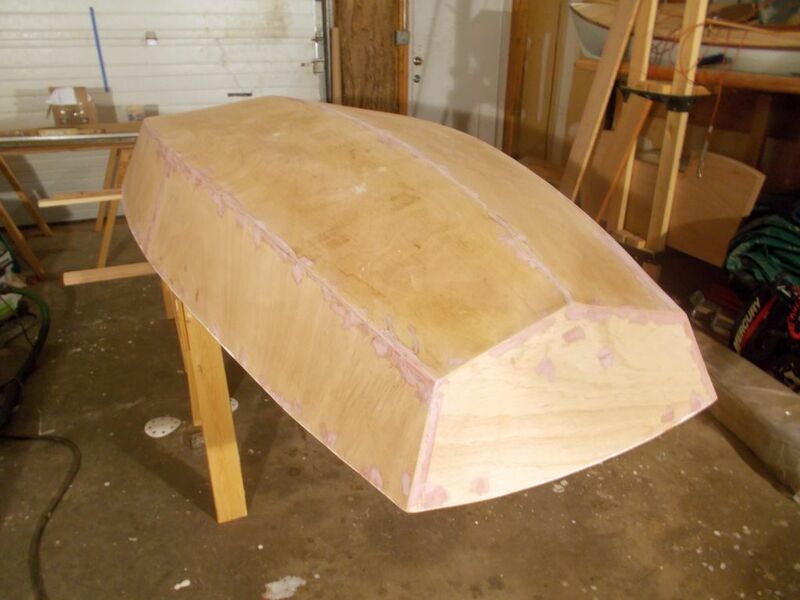 Sides wrap over the transoms, transoms wrap over the sides for a double layer on all exposed corners. 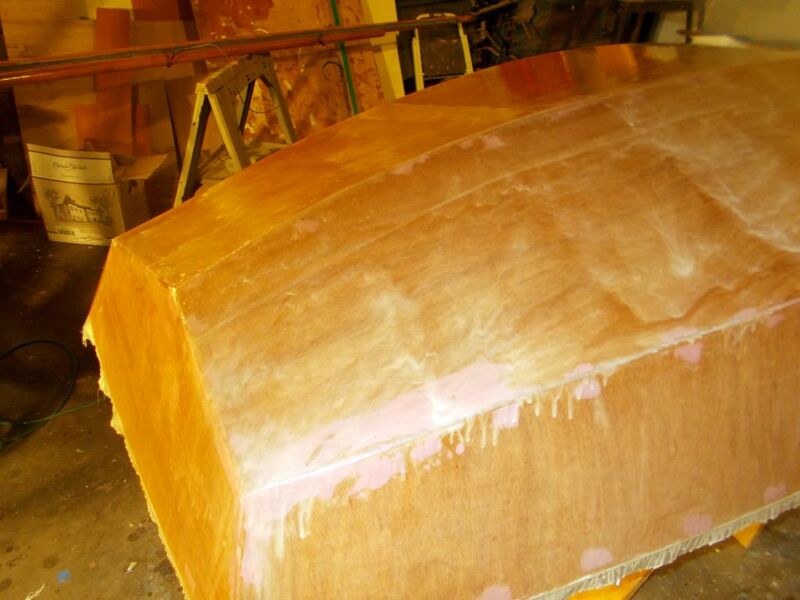 Thin coat, no microballons — this is what I should have done to the whole boat.